With homebuilders slowly, slowly on the mend, I was curious just what the satellite beneficiaries of any lasting recovery in homebuilding are. There are the obvious ones such as appliance makers (Whirlpool, etc.) and home improvement stores (Lowes and Home Depot). It was a shot in the dark but I wanted to see if there was anyone in transportation that was correlated with homebuilders. As a starting point, I considered railroads, which haul commodities and raw materials across the country. Calculating the correlations between leading homebuilders (TOL, DHI, PHM, LEN) and railroads (CSX, KSU, NSC, UNP) over the past 10-year span. It turns out if there is a connection, it is not at all clear. For TOL, the luxury homebuilder operating on both coasts, the correlation coefficient is very, very low and may either be positive or negative. Lennar, Pulte, and DH Horton appear to have a significant negative correlation to all four railroads. The strongest correlation is between KSU and TOL. For NSC and TOL, note that about 1/10th of Norfolk's revenues come from hauling metals and construction materials including brick and cement. "CSX", "KSU", "NSC", "UNP", "LEN", "PHM", "DHI", "TOL"
Universities are interesting creatures financially speaking. They are relevant because they often float general obligation and revenue bonds to finance themselves. These bonds are typically tax exempt and are part of the greater municipal bond universe. As an asset, they are infrequently traded. 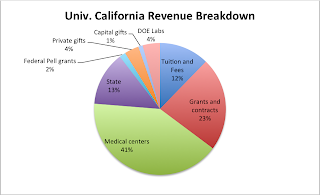 As a business, they derive a considerable amount of revenues from their medical center operations, government research contracting, government appropriations, and finally tuition. Consider the University of California system, the largest of its kind 302k students and 136k faculty spread across 10 campuses. The lion's share of the revenues come from the medical centers and government research grants/contracts. 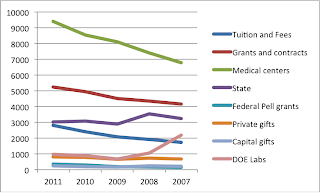 Actual state appropriation funding and tuitions contribute only a quarter of the total revenue. 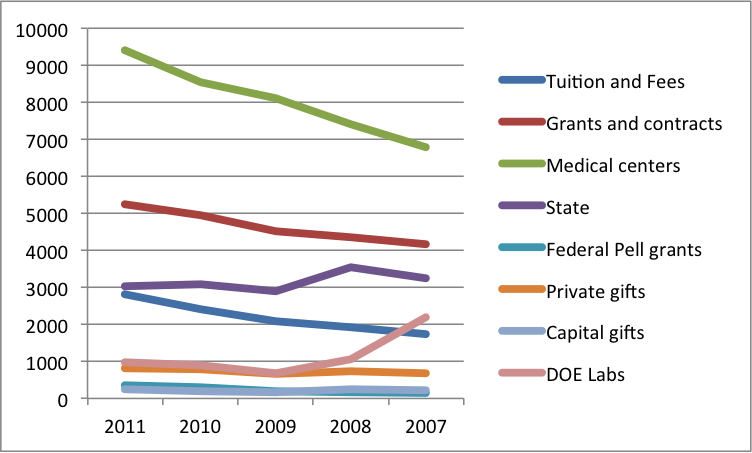 Over the past 5 years, the tuition/fees category grew by about 61%. Medical center and government contracts revenue grew by 38% and 26% respectively. State appropriations and DOE lab contributions actually declined by 6% and 55% respectively. The chief risk in to the business is the defined-benefit pension program (amounting to a $2B/year payout). The number of retirees receiving payments may have only increased by 13% over the past 5 years, but the amount of payments has increased by 25.6% over the same period. Two years (2008 and 2009) of massive depreciation of the assets in the plan certainly did not help. Over the same period, the income part of the plan investments (interest and dividends) declined by 41% at least partially due to the low-interest rate environment of recent years. The California state government budget crisis led to some deferred payments to the university system in 2010-2012, amounting to around $500MM each year. What does the fixed income market look like after a horrible superstorm and on the an election day which may or may not be decided quickly? Since the announcement of QE Unlimited, mortgage-backed securities prices have come down quite a bit as has their commercial MBS cousin. In fact, MBSes have been pulling back pretty much all day. Emerging market debt has pulled pulled back. The following table shows the 1 week max drawdown, max drawdown as a % of principal, and standard deviation of prices for several fixed income ETFs. I bond (savings bond) rates have been reset to a mere 1.76% due to persistently low CPI numbers.